Three Cork restaurants – all first time recipients – are amongst 14 Irish restaurants awarded a coveted Michelin Star in the 2019 Michelin Guide Great Britain & Ireland just published. The three Cork recipients are the Japanese restaurant Ichigo Ichie in Cork City Centre and two West Cork village restaurants – Mews in Baltimore and Chestnut in nearby Ballydehob. 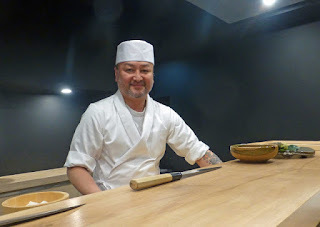 Ichigo Ichie (translated ‘once in a lifetime’) and its chef Takashi Miyazaki bring kappou-style dining to Ireland. Extensively trained in fusion teppanyaki cooking, chef Miyazaki combines Japanese culinary craft and art with the best of Irish seasonal ingredients to create exquisite dishes that he prepares and serves, cross-counter, in what he calls ‘a one-to-one environment’. The success of West Cork’s two first-time Michelin Star recipients – Mews in Baltimore and Chestnut in Ballydehob – underlines the region’s growing reputation as a ‘fine food, fine dining’ destination, celebrated annually in the popular Taste of West Cork event. Baltimore’s Mews Restaurant is founded on the principle of exploring Irish cuisine through the extraordinary variety of natural ingredients that the region has to offer. It serves a tasting menu based on the best local produce that it sources directly from small farmers, market gardeners, foragers and local fishermen. Restaurant Chestnut – which looks out upon a monument to famed world heavyweight wrestler Danno O’Mahony at the entrance to Ballydehob village – is a comparatively new establishment on the West Cork dining scene. Occupying the premises of a former character-filled pub, the intimate 18-seater establishment is the creation of Cork-born chef Rob Krawczyk. Inspired by nature, its ever-evolving menu, featuring the best of seasonal ingredients, is said by Rob ‘to have been influenced by his parents’ strong culinary and artistic heritage’ instilled in him when growing up in neighbouring Schull village. Other restaurants that hold their Michelin Star from previous years are the 2-star Restaurant Patrick Guilbaud and the 1-star Chapter One, L’Ecrivain and The Greenhouse in Dublin City and Heron & Grey in Blackrock village. Elsewhere, other 1-star restaurants are Aniar and Loam (Galway City), Campagne and Lady Helen at Mount Juliet Hotel (Kilkenny), Wild Honey Inn, Lisdoonvarna (Clare) and House Restaurant at Cliff House Hotel, Ardmore (Waterford). In Northern Ireland, two Belfast restaurants - Eipic (Howard Street) and Ox (Oxford Street) – have also retained their Michelin Star status. Michelin Bib Gourmand awards recognise those establishments offering good food at affordable prices of EUR40 or less for a three-course meal. Four newcomers join the list of 24 Bib Gourmand recipients in the Republic of Ireland whose names feature in the 2019 Michelin Guide. They are: Clanbrassil House (Clanbrassil Street, Dublin); Tartare Café & Wine Bar (Galway City); Brownes (Tuam) and Dillon’s (Timoleague, Cork). Others, all of which retain Bib Gourmand status from earlier years, are 1826 Adare (Adare); Aldridge Lodge (Duncannon); Bastion (Kinsale); Chart House (Dingle); Copper Hen (Tramore); The Courthouse (Carrickmacross); Giovannelli (Killorglin); Kai (Galway City); Morrissey’s (Doonbeg); Sha-Roe Bistro (Clonegal) and TwoCooks (Sallins). In Dublin city, Bastible (South Circular Road); Craft (Harold’s Cross); Delahunt (Camden Street); Etto (Merrion Row); Pichet (Trinity Street); Pigeon House (Clontarf); Pig’s Ear (Nassau Street); Forest & Marcy (Ranelagh) and Richmond (Portobello) retain their Bib Gourmand status. In Northern Ireland, Clenaghans Restaurant, near Aghalee, joins the list of seven Michelin Bib Gourmand establishments in the province. Retaining their awards from last year are Fontana and Noble (both Holywood); Wine & Brine (Moira); Belfast’s Deanes at Queen’s, Bar+Grill at James’ Street South, and Home in Wellington Place. For the wider guidance of readers and visitors to Ireland, this year’s Michelin Guide lists a total of 341 establishments in the Republic of Ireland and 71 in Northern Ireland, including many that offer overnight accommodation. Published today by tyre manufacturer Michelin, the Great Britain & Ireland 2019 Guide is priced at EUR18.99 and is available athttp://travel.michelin.co.uk/ and in bookshops from Thursday, October 4th.